He was born in 1965 in the town of Farqîn (Silvan), in Amed (Diyarbakır) Province. After he completed primary and secondary school in Silvan, he graduated from the Department of Mathematics in the Faculty of Education of the Dicle University in 1985. 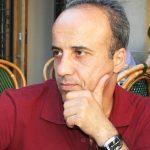 He has been writing short stories and novels in Kurdish, compiling and researching etymology in the field of Kurdish, and writing reviews of literary works since 1996. He has been working to comprehensively collect Kurdish idioms and document Kurdish language, orthography, standardization and etymology all in one. Additionally, he has been translating literature from Turkish into Kurdish as well. In 2004, together with a group of his writer friends, he published W, a bimonthly periodical of culture, art and literature, and edited it for two years. Between the years of 2008 and 2010, he wrote articles on cultural and literary topics for the Kurdish daily newspaper Azadiya Welat. Zeraq, who still lives in Diyarbakır, teaches mathematics.